Problem: Increasing demand for natural honeysuckle and apple cream rinses created a manufacturing bottleneck for Tom's of Maine, Inc., who manufactures and sells natural personal care products such as toothpastes, shampoos, conditions, deordorants and soaps at their Kennebunk, Maine plant. 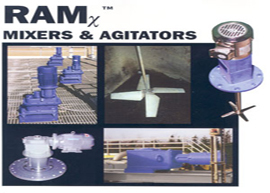 Products were being made in a 600 gallon, single shell tank agitated with a marine propeller type mixer. An aqueous mix recirculated through a 12 tube heat exchanger until the temperature reached 60 deg. C (140 deg. F). In separate tanks, two waxlike solid ingredients were melted and heated to the mix temperature prior to careful blending with the aqueous phase to form an emulsion. When all went well, a 600 gallon batch of product was completed in 4-6 hours. 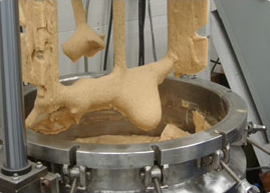 If air became incorporated into the emulsion during mixing and heating, emulsion quality deteriorated and product density would reduce, causing problems during filling. If the temperature during processing were to drop below 60 deg. C (140 deg. F) or exceed 70 deg. C (158 deg. F), the oil phase would separate and float to the surface. 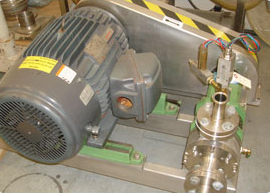 When manufacturing problems developed, additional mixing and recirculation were required. Extending processing time compounded the problems and delayed production schedules. Product consistency varied within a batch and emulsion quality was erratic. It was common for batches to require 8-12 hours of processing. A more homogeneous product and a shorter batch time were needed. 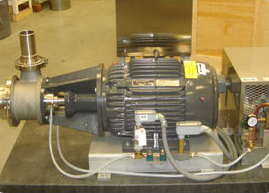 Solution: A reversible homogenizing mixer with an adjustable baffle was installed in a 1200 gallon, single shell tank. With this processing set-up, the same tank could be used to heat up and mix the aqueous phase and emulsify the wax/oil phase. The reversible homogenizer is first operated in the "down" mode with the adjustable baffle well below the liquid surface to prevent air incorporation. Approximately 4-5 hours are required to mix and heat the batch to 60 deg. C (140 deg. F) by circulating the aqueous phase through the external heat exchanger loop. Then, unheated and unmelted, the waxes and oils are almost instantaneously, dumped into the mix. Mixing is continued for about an hour with the mixer reversed. When the homogenizing mixer is reversed to the "up" mode, the "umbrella" flow pattern agitates the entire 1200 gallons vigorously. 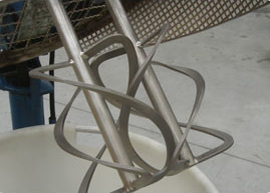 With the baffle position relocated to just below the liquid surface, the flow pattern is properly directed and the surface movement controlled to prevent air entrainment. The processing is completed by adding natural fragrances and herbal extracts while continuing intensive mixing for 10 minutes in the "up" mode to uniformly disperse the ingredients. Results: Production at Tom's of Maine, Inc., has increased by about 300% using the single tank set-up with the reversible homogenizing mixer. A 1200 gallon batch is completed in 5-6 hours compared to the 8-12 hours commonly required to make 600 gallons with the old system. 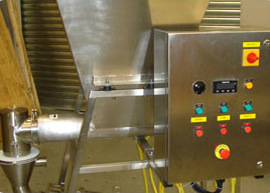 No longer is it necessary to heat and melt the wax, and the critical, slow feeding of the oil phase processing step has been eliminated. 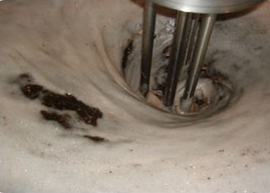 The plant has never had mixing problems with a batch since using the reversing homogenizing mixer. A batch of product is now consistent throughout. Development work on natural mouthwashes in spearmint, fennel and cinimint flavors showed that the high shear mixing action of the homogenizing mixer quickly solubilizes the concentrated flavorants. The desired consistency and appearance of the product are obtained without the addition of chemical additives often used in "non-natural" products.